Several of us are attending the ARC Orlando Forum this week at the Renaissance Hotel Sea World. Fieldbus Foundation is participating in several activities, including the ISA108 standards meeting on Monday, the ISA100 meeting on Tuesday. The Thursday morning session on using field networking technologies to manage field devices will feature panel discussions including both myself and our End User Advisory Council Chairperson John Rezabek, Sven Seintsch, a representative of the user group NAMUR, will also be on hand to discuss developments in Field Device Integration (FDI) on Thursday morning. We hope to see you there! The Fieldbus Foundation will be at Rockwell Automation’s Process Solutions User Group meeting (PSUG) this week. PSUG has grown considerably over the past several years as Rockwell Automation has grown its process automation business. With Rockwell’s commitment to FOUNDATION fieldbus and its recent registration of its DCS host under the latest 61b profiles, it only makes sense for us to be there at the show. One thing that also distinguishes Rockwell Automation from other fieldbus suppliers is its relationship with leading field device supplier Endress+Hauser. The two companies formed a special relationship in 2004 to provide a premier level of integration between the PlantPAX process automation system from Rockwell Automation and Endress+Hauser field devices. The two companies have also collaborated in the Plant Asset Management system space. Rockwell Automation also offers many other FOUNDATION fieldbus products through its network of ENCOMPASS partners, which you can see here. Partner companies include names like Pepperl+Fuchs, Phoenix Contact, GE Energy, Metso Automation, many others. So if you are in Philadelphia this week come stop by and see us at Rockwell Automation PSUG! The Fieldbus Foundation has a big presence at the Emerson Global Users Exchange this week at the Orange County Convention Center Hilton, and with good reason. With thousands of attendees, many of them end users, the Exchange is one of the premier events in the process automation industry. I am delivering the update presentation on our FOUNDATION for ROM program, Stephen Mitschke, our director of fieldbus products is delivering a presentation on the FDI (Field Device Integration) initiative, and Denise Lloyd, who is our director of training services, is delivering a great presentation on what it takes to develop a world class training program. Meet us at Achema Next Week! Myself, President of Fieldbus Foundation Rich Timoney, and Fieldbus Foundation Director of Technology Dave Glanzer will all be at the Achema trade show next week in Frankfurt, Germany. 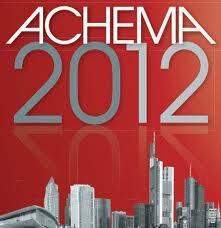 Achema is probably the biggest automation trade show in the world focused on the global chemical industry. The Fieldbus Foundation will be at Hall 11, Stand B29. We will once again be participating in the Field Communication Lounge with FDT, HART Communication Foundation, Profibus, and OPC. Fieldbus Foundation will also be bringing our FOUNDATION for ROM demo to Achema, so you will be able to see firsthand what we are doing with FOUNDATION for ROM and how it can benefit you. We will also be holding a press conference related to recent developments in FOUNDATION for ROM on Tuesday June 19th at 11 AM in the GRANAT room of Hall 11 on the ground floor. Hope to see you there! Many of our supplier members will also have a presence at the Field Communication Lounge, from smaller companies like APAT and FINT to Pepperl+Fuchs, Turck, Stahl, Endress+Hauser, Emerson, Honeywell, Siemens, Yokogawa, and more. Fieldbus Foundation is also part of FDI Cooperation LLC, and FDI will be having a press conference in the KORAL room, also on the ground floor of Hall 11, from 10-11 AM. ARC Advisory Group is having a series of panel discussion and presentations in conjunction with NAMUR and ZVEI called “Automation Dialog”. I will be participating in a panel titled “Operational Excellence” on Wednesday at 2 PM. You can get more info about the Automation Dialog series of talks here. I write a lot about the value of trade shows. Achema is one of the last truly great trade shows for the process automation business. It only comes around every third year and it attracts a wide range of automation suppliers, equipment vendors, engineering firms and solution providers, educational institutions, and, most importantly, end users. We look forward to attending. One of the things we are doing at the Foundation is to increase our presence at the major user group meetings. If there is one meeting not to miss in your annual calendar it is the Emerson Global Users Exchange. With close to 3,000 attendees, I think I can safely say that the Exchange is now the largest user group meeting that is totally focused on process automation. Other user group meetings are as big, but not so finely focused on process automation. Attending the Exchange this year was Stephen Mitschke, our director of products, who also heads up our testing and registration efforts. Stephen presented our vision for testing and registration of products and host systems at the foundation. You can access Stephen’s presentation here. For my own part, I delivered a presentation on FOUNDATION for Safety Instrumented Functions. After a successful end user demonstration in 2008, efforts around FOUNDATION for SIF stalled a little in the wake of the recession, but activity is ramping up again and we are looking to test and register the first wave of products within the next 18 months, and there are currently three separate end user pilot projects happening as we speak. You can access that presentation here. Emerson is a leader in FOUNDATION fieldbus and of course ours were not the only presentations given on the topic of fieldbus. In addition to the many fieldbus-related presentations, the full scope of Emerson fieldbus products and services were on display at the technology exhibits, which ran from Monday through Wednesday. Many Emerson partners were also in attendance, including several FOUNDATION fieldbus technology providers such as Softing, MTL, Pepperl+Fuchs, MooreHawke, and others. A complete list of partners that exhibited is available here. Emerson also announced that it has sold over 1,200 of its new DeltaV S-series H1 fieldbus interface cards. The new card eliminates marshalling by letting the fieldbus trunk directly on the H1 card without an intermediate marshalling cabinet. The new card measures output voltage and the current drawn on the bus. This can be used as an additional form of diagnostics. Changes in current drawn could indicate short circuit on a spur or other installation problem. Diagnostics modules or testers connected in parallel cannot do this. It is a nice complement to the communication statistics which are already built into the H1 card and seen from DeltaV diagnostics. Together, these diagnostics detect problems on either the field device-side or controller cabinet-side of the safety barriers, without adding any hardware. You can download a series of good FOUNDATION fieldbus tutorial presentations from the Emerson Exchange slideshare site here. You can also access chief Emerson blogger Jim Cahill’s many posts regarding the Exchange here. I attended a very good presentation on the new Softing gateway that will be used by Emerson in place of its Rosemount’s 3420 fieldbus gateway. Like the existing 3420 gateway, the Softing FIM 110 FF gateway is a great way to provide integration between existing legacy control systems and fieldbus devices, as well as asset management applications. The FIM 110 FF is based on Softing’s existing line of fieldbus gateways. The FIM 100 also provides integration of Modbus and other network technologies. Softing also provides a configuration tools to handle configuring blocks and schedules. AMS handles the transducer/resource configurations. Both Softing and Emerson will sell the product. We hear a lot about Emerson’s flowmeter and transmitter offerings, but did you know that the company has truly availed themselves of the full functionality of FOUNDATION fieldbus with its analytical instruments? Jim gray of Rosemount Analytical gave an excellent presentation on the many things you can do with their products in a FOUNDATION fieldbus infrastructure, including full incorporation of NE-107 field diagnostics and function block capabilities. There is a lot of information regarding Rosemount Analytical’s fieldbus offerings here. Some users find great success installing fieldbus in existing plants where multiple temperature measurements are required. We saw a good case study from Valero on just that topic, where the end user realized hundreds of thousands of dollars in installed cost with the Rosemount 848 T multiple input temperature transmitter. This case just shows that it is possible to realize significant installed cost savings even on a small fieldbus project. We also attended a very informative presentation by Al Dewey of Emerson on the 475 handheld communicator, which is ubiquitous in the process industries. Al’s presentation was designed around addressing best practices in using the device, particularly when it comes to management of change. Many field technicians will make changes to a device with the 475, but these are not always picked up by the process automation system. Al gave several good pointers on how to do it right. Again we look forward to attending next year and appreciate all those who attended our sessions. I just returned from what was a very successful Honeywell Users Group Americas conference, with about 600 end user customers and total of around 1,000 attendees if you count Honeywell people and their partner companies. 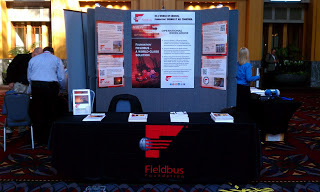 You didn’t have to look far to see the FOUNDATION Fieldbus content at the show. Highlights included Joe Serafin’s presentation on Honeywell Fieldbus Differentiators on Wednesday afternoon. Right after Joe presented I got to deliver my presentation on the current state and roadmap of the Fieldbus Foundation and FOUNDATION Technology. There were also some new fieldbus related product introductions, including a new version of Honeywell’s Asset Manager PKS, a new Honeywell Fieldbus Interface Module that is capable of handling up to eight H1 links, and the new Pepperl+Fuchs Advanced Diagnostics Module, which is seamlessly embedded in the Experion PKS process automation system. We also saw fieldbus mentioned in some of the end user presentations. Gordon Staub of global engineering firm WorleyParsons talked about some of the challenges of successful project execution in a large installation in the Canadian oil sands that included 3,000 FOUNDATION Fieldbus devices. You can read more about Gordon’s presentation at the HUG 2011 Live Site. As I mentioned in my previous post about HUG, Honeywell has several partners under their PKS Advantage program, and these were all in attendance. Many of these partners offer products that complement Honeywell’s fieldbus solutions, including Flowserve, Masoneilan Dresser, Metso, MTL, Phoenix Contact, R Stahl, and Turck. In addition to offering a registered integrated host and 16 registered devices, Honeywell also has its own on site interoperability testing lab in Bangalore and you can get a list of devices tested by Honeywell here. It’s fairly extensive. I am attending the Honeywell Americas User Group Meeting this week at the JW Marriott Desert ridge in Phoenix. HUG is one of the largest user group meetings in the world of process automation. Preliminary reports show over a thousand attendees, with topics ranging from process safety to alarm management and, of course, fieldbus. I will be presenting the Fieldbus Foundation current state and roadmap on Wednesday at 2 PM. Honeywell is also showcasing their fieldbus solutions in their exhibit space this week, which includes the new Experion Fieldbus Interface Module. Also of note are the Assset Manager PKS Plant Asset Management platform and Honeywell field devices. There are also a lot of Honeywell partners here that offer fieldbus solutions, including MTL, Pepperl+Fuchs, Stahl, and third party field device and control valve suppliers that offer fieldbus products under Honeywell’s PKS Advantage program.